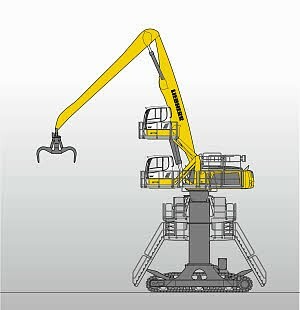 In the new Liebherr product range for material handling, the crawler material handlers have been completely redesigned and provided with substantial technical innovations. As well as the new progressive design of the machines, Liebherr has focussed on productivity and ergonomics, for example in the redesigned driver’s cab, which offers increased safety and reduces fatigue while working. The LH crawler material handler series offers various combinations of superstructure and undercarriage for maximum effectiveness whatever the application. Whether for handling scrap metal, for use in ports or for recycling, the newly developed, robust crawler undercarriage provides high stability, coupled with fast work cycles and increased payloads. Along with other key components manufactured in-house, the machines in the LH series are extremely reliable and durable. The machine also features the patented ERC system that gives it additional power while substantially saving fuel.